Moreover, the poor, highly fertile countries that once churned out immigrants by the boatload are now experiencing birthrate declines of their own. 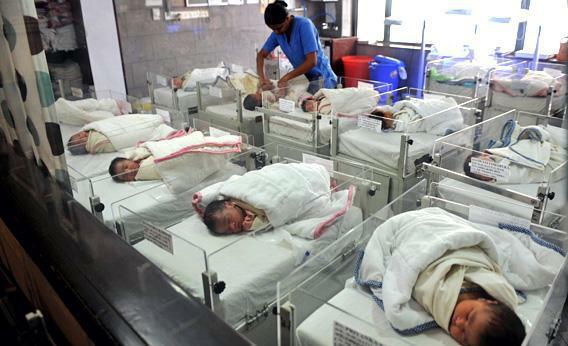 From 1960 to 2009, Mexico’s fertility rate tumbled from 7.3 live births per woman to 2.4, India’s dropped from six to 2.5, and Brazil’s fell from 6.15 to 1.9. Even in sub-Saharan Africa, where the average birthrate remains a relatively blistering 4.66, fertility is projected to fall below replacement level by the 2070s. This change in developing countries will affect not only the U.S. population, of course, but eventually the world’s. If the Germany of today is the rest of the world tomorrow, then the future is going to look a lot different than we thought. Instead of skyrocketing toward uncountable Malthusian multitudes, researchers at Austria’s International Institute for Applied Systems Analysis foresee the global population maxing out at 9 billion some time around 2070. On the bright side, the long-dreaded resource shortage may turn out not to be a problem at all. On the not-so-bright side, the demographic shift toward more retirees and fewer workers could throw the rest of the world into the kind of interminable economic stagnation that Japan is experiencing right now. It’s far from certain that any of this will come to pass. IIASA’s numbers are based on probabilistic projections, meaning that demographers try to identify the key factors affecting population growth and then try to assess the likelihood that each will occur. The several layers of guesswork magnify potential errors. “We simply don’t know for sure what will be the population size at a certain time in the future,” demographer Wolfgang Lutz told IIASA conference-goers earlier this year. “There are huge uncertainties involved.” Still, it’s worth discussing, because focusing too single-mindedly on the problem of overpopulation could have disastrous consequences—see China’s one-child policy. One of the most contentious issues is the question of whether birthrates in developed countries will remain low. The United Nation’s most recent forecast, released in 2010, assumes that low-fertility countries will eventually revert to a birthrate of around 2.0. In that scenario, the world population tops out at about 10 billion and stays there. But there’s no reason to believe that that birthrates will behave in that way—no one has every observed an inherent human tendency to have a nice, arithmetically stable 2.1 children per couple. On the contrary, people either tend to have an enormous number of kids (as they did throughout most of human history and still do in the most impoverished, war-torn parts of Africa) or far too few. We know how to dampen excessive population growth—just educate girls. The other problem has proved much more intractable: No one’s figured out how to boost fertility in countries where it has imploded. Singapore has been encouraging parenthood for nearly 30 years, with cash incentives of up to $18,000 per child. Its birthrate? A gasping-for-air 1.2. When Sweden started offering parents generous support, the birthrate soared but then fell back again, and after years of fluctuating, it now stands at 1.9—very high for Europe but still below replacement level. The reason for the implacability of demographic transition can be expressed in one word: education. One of the first things that countries do when they start to develop is educate their young people, including girls. That dramatically improves the size and quality of the workforce. But it also introduces an opportunity cost for having babies. “Women with more schooling tend to have fewer children,” says William Butz, a senior research scholar at IIASA. In developed countries, childrearing has become a lifestyle option tailored to each couple’s preferences. Maximizing fertility is rarely a priority. My wife and I are a case in point. I’m 46, she’s 39, and we have two toddlers. We waited about as long to have kids as we feasibly could because we were invested in building our careers and, frankly, enjoying all the experiences that those careers let us have. If wanted to pop out another ankle-biter right now, our ageing bodies might just allow us to do so. But we have no intention of trying. As much as we adore our little guys, they’re a lot of work and frighteningly expensive. Most of our friends have just one or two kids, too, and like us they regard the prospect of having three or four kids the way most people look at ultramarathoning or transoceanic sailing—admirable pursuits, but only for the very committed. That attitude could do for Homo sapiens what that giant asteroid did for the dinosaurs. If humanity is going to sustain itself, then the number of couples deciding to have three or four kids will consistently have to exceed the number opting to raise one or zero. The 2.0 that my wife and I have settled for is a decent effort, but we’re not quite pulling our weight. Are we being selfish? Or merely rational? Our decision is one that I’m sure future generations will judge us on. Assuming there are any.